The first Platonic solid, Tetrahedron, is self-dual; higher dimensional analogues are called simplex/simplices; tetrahedral shapes can be found in vary polyhedral clusters. Adamantane-like structure, Ada20, is a hyper-tetrahedron, a tetrahedron of which points were changed by four tetrahedral units P@4C20; the central hollow has the topology of small fullerene C28; Ada20 is the unit of “diamond D5”, or MTN zeolite. Map operations, like medial m, truncation t and leapfrog l were applied to Ada20, to obtain a variety of spongy or filled structures. Tetrahedral hyper-structures decorated only with dodecahedra were also described. Figure count was used for characterization of the discussed clusters. 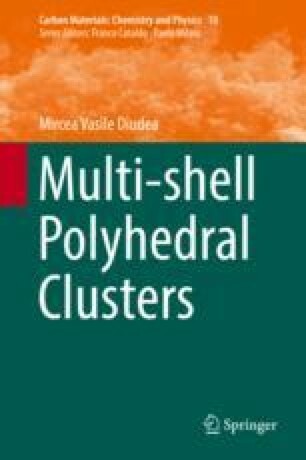 An atlas section illustrates the discussed multi-shell polyhedral clusters.